A few years ago I was in New Mexico rummaging through a flea market and ran across a 5x7-inch glass plate negative that intrigued me, so I bought it, for five dollars. Unfortunately it broke on the return home and I stashed it in a box of old images. I ran across it the other day and brought it to work to scan it. 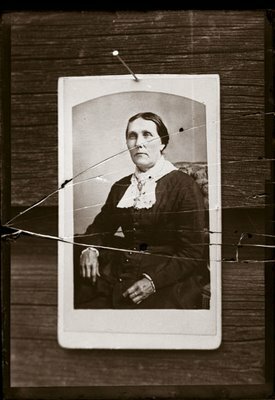 I was originally attracted to this image because it was a glass plate negative of a carte de visite nailed to a wooden plank, the earliest form of photo reproduction I had seen. Yesterday I printed the image on an Epson 9600. So this is an inkjet print of a glass plate negative of a carte de visite, a little photo history lesson in itself. You wrote: So this is an inkjet print of a glass plate negative of a carte de visite, a little photo history lesson in itself. I would say instead "... and now is a jpeg image in a web log of an inkjet print of a glass plate negative of a carte viste ...". OR "... a jpeg image in a web log of a scan of a glass plate negative of a carte viste ...". It is even more fascinating that way.